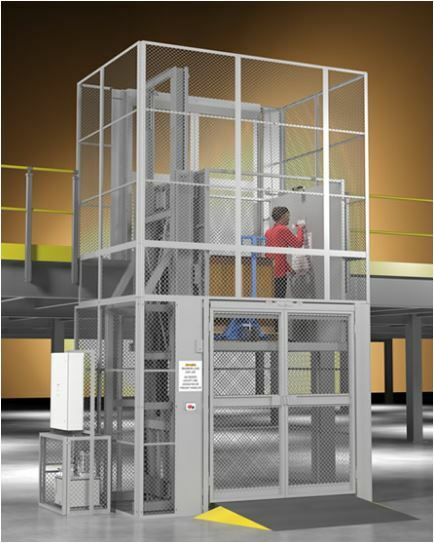 Wildeck's RiderLift™ allows personnel to travel safely between levels at a fraction of the cost of an elevator. The new and very affordable RiderLift™ RML, by Wildeck, allows authorized personnel to safely travel with their material handling between levels. The RiderLift™ is the ideal solution to better utilize the capacity gained in your facility from mezzanines, rack systems, pick modules and modular offices. The hydraulically-operated standard RiderLift™ has a cantilever design that is available in both "C" or "Z" loading patterns. It boasts numerous safety features and complies with the safety code for elevators and escalators. With a lifting speed of 20 FPM and lifting capacity of 2,500 lbs., RiderLift™ alleviates the need to climb stairs or rely on someone else to off-load material when your lift reaches its destination. The operator is in total control with RiderLift™ rideable material lift. For more information regarding Wildeck's RiderLift™ (RML) and the benefits it may have for your company's operation, talk to your Sales Engineer.